The following is a summary of the 2015 citation analysis results for Urban Planning faculty in North America (mostly U.S.). The lists of urban planning departments and faculty were based on the 20th Edition (2014-2015 academic year) Association of Collegiate Schools of Planning (ACSP) Guide to Undergraduate and Graduate Education in Urban and Regional Planning. Results for 2013 and 2014 describe the methodology (click years to see previous analyses). A recent article in the Journal of Planning Education and Research (JPER) provides in-depth background on the objectives and overall approach (go to article). Table 1 shows the top 25 planning schools based on the median number of Google Scholar citations per faculty member (this includes only departments with a minimum of 5 tenure-track faculty). Also, see the department rankings by faculty tenure here. 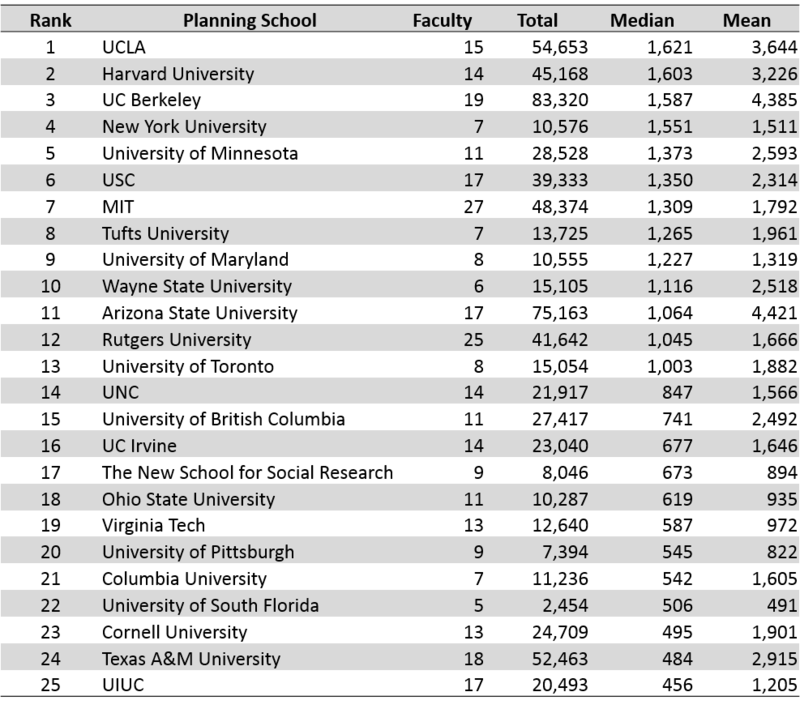 UCLA, Harvard, UC Berkeley, and NYU retain the top 4 spots, with the University of Minnesota moving up from last year to become the fifth most productive planning faculty. New to the top 25 in 2016 are Virginia Tech (19), the University of Pittsburgh (20), University of South Florida (22), and Cornell University (23). These rankings shift slightly from year to year based on changes in faculty rosters (through retirements, new additions, affiliation changes, etc.) ACSP membership, and data adjustments. Additionally, individual faculty citation counts increase each year at varying rates averaging 20-30 percent for tenured faculty (associate and full professors). The total number of citations for current urban planning faculty increased from just under 800,000 in 2014 to over 1,000,000 at the end of 2015. 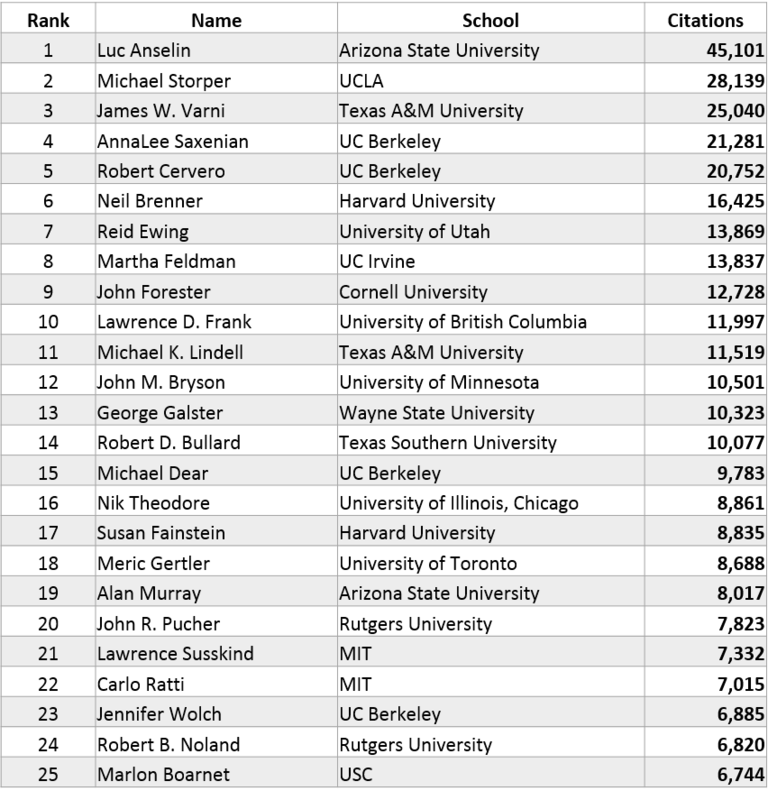 The top 25 cited urban planning faculty are shown in Table 2. The list contains a few changes, most notably the inclusion of Robert Bullard (14), now at Texas Southern University. The data also point to citation thresholds that emerge for the three ranks (Assistant Professor, Associate Professor, and Full Professor). Figure 1 shows the mean and median values for each rank. 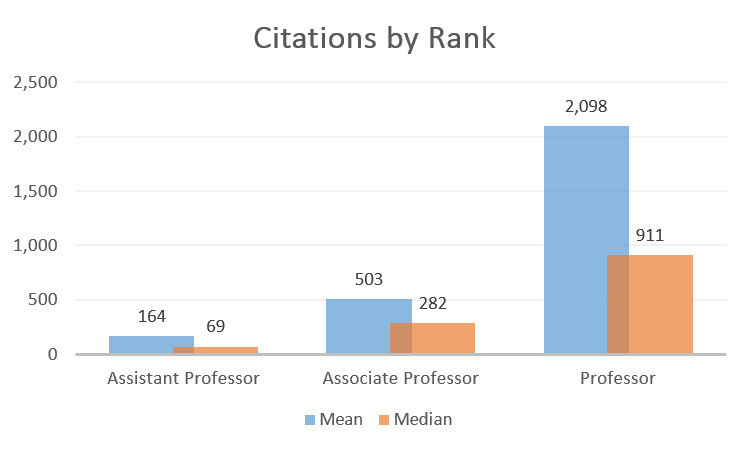 The middle range of citations for Assistant Professors is about 70, with nearly 300 for Associate Professors, and just over 900 for Full Professors. This corresponds with median years of experience at 7, 15, and 30 years respectively. There is a significant amount of variation within each rank with years of experience (years since terminal degree was received) explaining only about 6 percent of the variation in individual citation activity. Related to my analysis posted in October 2015, there is no statistical difference in citation activity between female and male urban planning faculty for ACSP member schools. *Note: A tool to query the data for individual faculty and departments will be available soon. This entry was posted in Citation analysis. Bookmark the permalink. Interesting. Have never heard of half the people listed in the top 10, including the number one. Must be a whole body of literature I have overlooked (probably JAPA). But then this is restricted to urban. Have you ever done an analysis of planning as a whole discipline (ie including environmental, regional etc)? Hamish the study isn’t specific to urban v regional v environmental. This is every faculty member who is in a planning program in the US. The jper article describes more detail.